Good News!!! 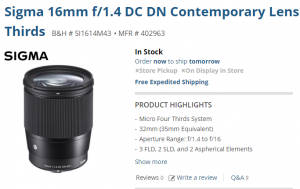 The newly announced Sigma 16mm F1.4 DC DN Contemporary lens is now in stock and shipping in most US stores Amazon/ B&H/ Adorama. It costs $449, available for Sony E and MFT mounts. SUPPORT MirrorLess Talk, BUY FROM ONE OF OUR AFFILIATE RETAILERS, THANKS !